You may have caught the recent announcement that our Hummingbird performance plugin has been integrated with CloudFlare. But given that CloudFlare works on a domain level, what does this mean if you’re running a Multisite network? The good news is that with one CloudFlare account you can cover multiple domains. Unlike many services, you don’t need a separate account for each domino, and you don’t need to pay extra if you’re using Multisite with subdomains or mapped domains. In this post I’ll show you how to integrate Hummingbird with CloudFlare for the sites on your network, and identify the different approaches you need to take depending on whether you’re using subdirectories, subdomains or mapped domains. Note: If you’re using Hummingbird and CloudFlare together on a single site installation of WordPress, this guide will also help you get set up. But let’s start with an intro to CloudFlare. A Content Delivery Network (CDN). This distributes the data from your site across multiple servers in different locations, meaning visitors to your site get faster response times as the data isn’t stored halfway across the world. Security delivered via a firewall as well as protection from DDoS attacks. CloudFlare is designed to give people running small sites access to the kind of tools that only those managing huge enterprise level sites have had in the past, by leveraging its community of users and being able to learn from what’s happening to sites across its user base and apply that to the rest of the sites signed up with it. Let’s start by looking at how you set up Hummingbird with CloudFlare on your Multisite network. Once we’ve done that I’ll move on to looking at how it interacts with different domain setups. Start by installing Hummingbird on your Multisite network, if you don’t already have it installed. The easiest way to this is by using the WPMU DEV Dashboard. When you first use Hummingbird, you’ll be prompted to run a performance scan. Let’s see if it improves once I’ve activated CloudFlare. Now you’ve got Hummingbird up and running, it’s time to set yourself up with CloudFlare. If you haven’t already, create an account and log in. You can create a free account or there’s a choice of premium options depending on your need. 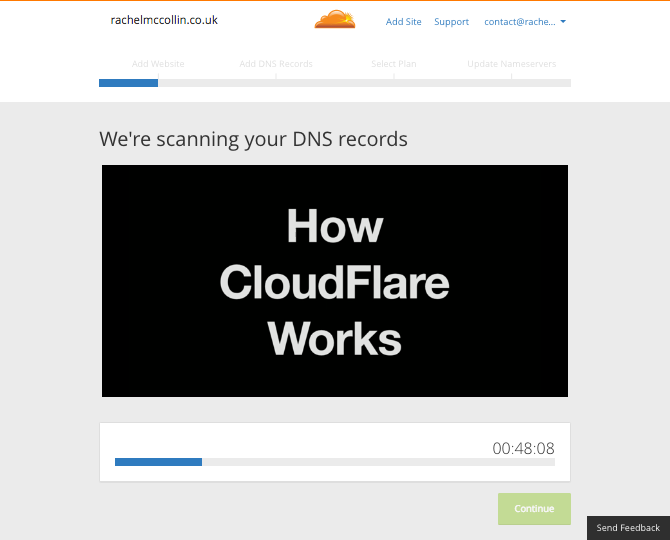 Click the Scan DNS Records button and CloudFlare will check your site’s DNS. When it’s done, click the Continue button. You’ll then see details of your DNS records for your domain. Check these and confirm they’re correct by clicking the Continue button. Next you’ll be asked to select a website plan for this domain. Pick the one that works for you: I’m going with a free one for now. In the first field, enter the email address you used to register with CloudFlare. Next to Global API Key, click on the View API Key button. Your API key will appear in a pop box. Copy that and paste it into the second field in the CloudFlare metabox in Hummingbird. Then click the Connect button. Hummingbird will connect with your CloudFlare account and replace those fields with a Select domain drop-down box. Use this to select the domain of your network and click the Enable CloudFlare button. Once your DNS changes have taken place (mine took about an hour), you can run a new test to see what effect CloudFlare is having on your network. That’s not much but bear in mind I haven’t done anything yet to optimize my site. If I follow the tips given by Hummingbird I can improve things even more. Depending on your Multisite setup, you may need to configure CloudFlare to work with the sites on your network. Let’s take a look at each scenario. Subdirectory based networks are the easiest to manage here. The good news is that you don’t need to do anything else once you’ve followed the steps above. This is because all of the sites in your network share the same root domain, so they’ll all benefit from the CloudFlare setup for that domain. But even if you’re using subdirectories, if you’ve mapped some domains to your network you’ll still need to do some extra configuration. More of which shortly. Subdomains are a little more complicated. You can add them manually to your CloudFlare account, or alternatively you can use wildcard subdomains. 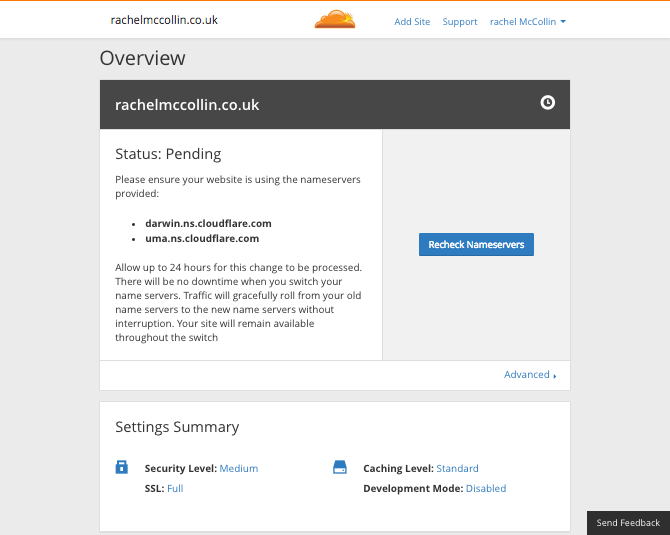 Open your CloudFlare account, select the domain name of your network and click on the DNS icon at the top of the screen. Click the Add Record button and the subdomain will be added to your CloudFlare account. You don’t need to do anything in Hummingbird or in the site’s admin screens. Then click the Add Record button to add wildcards to your account. If you’re mapping domains to your network then you’ll need to add those to CloudFlare as if they were a separate website. In CloudFlare, click on Add Site at the top of the screen and follow the steps outlined in the first part of this post. Once you’ve added the mapped domain, ignore the instructions to edit your domain’s nameservers. You want the domain to continue pointing to your network using A or CNAME records so you mustn’t change the DNS settings. This leads to a mismatch in the Domain Mapping plugin: your network’s nameservers are pointing at CloudFlare while the mapped domain is pointing at the servers where you actually have the site hosted. This means that when the plugin checks the IP address it’ll return an error. You can easily fix this by turning off the domain verification check in the domain mapping plugin. In your network admin screens, go to Settings > Domain Mapping. Make sure that No is selected, then save your changes. Note: to access this option you’ll need to install our premium Domain Mapping plugin, not the free version. So that’s how you set up your WordPress Multisite network with Hummingbird and CloudFlare. Once you’ve done this and made some tweaks to your Hummingbird settings you’ll find that your site is faster and more secure. And all with just a few minutes work – well worth it. Have you seen using Cloudflare with Hummingbird ? How has it improved your site's performance? Let us know in the comments!